C. Greenberg, Matisse, New York, 1953, pl. 36 (illustrated). R. Huyghe, Henri Matisse, Paris, 1953, pl. 36 (illustrated). P. Lbecker, Matisse, Copenhagen, 1955, pl. 36 (illustrated). J. Elderfield, The Cut-Outs of Henri Matisse, New York, 1978, pl. 12 (illustrated in color). Paris, Muse National d'Art Moderne, Henri Matisse: Oeuvres Rcentes, 1947-1948, June-September 1949, p. 14, no. 16. Washington, D.C., National Gallery of Art; Detroit, Institute of Arts, and St. Louis, Art Museum, Henri Matisse: Paper Cut-Outs, September 1977-March 1978, pp. 132 and 135, no. 62 (illustrated). New York, The Museum of Modern Art, Henri Matisse: A Retrospective, September 1992-January 1993, pp. 416 and 429, no. 368 (illustrated in color, p. 429). Henri Matisse first began using cut paper during the 1930s in the muted background shapes of Dance I and Dance II (the mural-scale compositions of the Barnes Collection) and continud to use it intermittently in the following decade in conjunction with painting and drawing. He returned to it during the second World War for the cut-out forms for Jazz, the book that the publisher Triade commissioned in 1943. Beginning with the Jazz commission and continuing throughout his use with cut paper, Matisse painted the paper with Linel brand gouache. "Unlike the Cubists who used scraps rescued from wastepaper baskets or dadaists who cut up old mail-order catalogues, Matisse was not even satisfied with the best commercial colored papers. He had his own papers painted with gouaches of his own choosing and then proceeded with scissors..." (A.H. Barr, Jr., Matisse: His Art and His Public, New York, 1966, p. 274). Matisse cut the paper with the scissors held wide open so that the blades sheared through the sheet, rather than clipping. The possibilities of cut paper became, in his hands, a fundamentally different technique both from Cubist papiers colls and Surrealist collages. The enormous potential for this approach became immediately apparent to the artist, for it was neither drawing nor painting, but a combination of the two: "Instead of drawing an outline and filling in the color...I am drawing directly in color." (quoted in exh. cat., op. cit., New York, 1992, p. 413). As Matisse described it to Andr Verdet, "The shape of the figure springs from the action of the scissors, which give it the motion of organic life. This tool, you see, does not modulate--does not brush onto, but cuts into--a point that should be emphasized, for it makes the criteria of observation completely different... My cut-outs, I would hope retain the sovereignty of the hue that characterizes my drawing... My paper cut-outs also owe something to a technical procedure that comes from statuary" (fig. 1; quoted in Entretien, Notes et crits sur la peinture, Paris, 1978). The pinning of images to the wall began the second of the two processes which produced the cut-outs: the decorative organization of the pre-formed signs. This was by far a longer and more deliberative process than that of the first one: it sometimes lasted several months and even from year to the next for larger works. Matisse would change the position of the images, adding new ones, at times modifying existing ones, until the desired configuration was reached. The images of coral, shellfish and leaf forms were developments of those used in Jazz and were reminiscent of the arabesques in paintings such as L'intrieur avec aubergines, 1911 (Muse de Grenoble, France), or the severely flattened images of works such as La musique [La guitariste] (fig. 2). Composition la croix rouge is among the series of works that follow Jazz, 1943-1944 and Ocanie, la mer, 1946 (Centre Georges Pompidou, Paris), one of Matisse's earliest commissioned cut-outs. Executed in Vence at Matisse's villa, Le Rve, they were conceived as modest compositions that are usually upright in format; but unlike Polynsie, le ciel, 1946 (Centre Georges Pompidou, Paris), where the color is limited to sea and sky blues, in the new series Matisse worked with colors of extraordinary intensity and brilliance. A vivid sense of life and movement is presented through the dense, glowing masses of rich color and the intimations of wavering movement. In these works the forms are disconnected from their original subjects (seaweed, algae, snakes) and become emblematic of creation and creativity itself. John Elderfield has suggested that Matisse, in his search to create an earthly paradise, had returned to the principles of the Symbolists -- "an attempt to make something more exact to inner experience than discursive explanation; and a struggle for the kind of self-possession that would allow art to seem self-possessed, self-contained with an internal equilibrium entirely its own" (J. Elderfield, op. cit., p. 39). Matisse's achievement of this, through the signs of the paradise that had been adumbrated in his paintings of the 1900s (such as Bonheur de Vivre, 1906; Barnes Collection, Merion, Pennsylvania) is clearly apparent in the works of 1947. Their astounding simplicity and brilliance belies their modest size. Their significance is clear when they are seen in relation to the early paintings and the final cut-outs. They recapitulate the early themes and form the overture to the last act of Matisse's search for the ultimate expression of a pastoral paradise. The present work was exected in 1947 and displayed on the walls of Matisse's studio during the working process. (Matisse had been partially bed-ridden since 1941 and the process of composing consisted of cutting and printing the works to the walls of the studio until the composition satisfied him.) In the 1947 studio photograph (fig. 3) Composition la croix rouge can be seen flanked by Amphitrite (Private Collection, France) and overlapped at the top by the left-hand panel of L'oiseau et le requin (Private Collection, United States). The elements of the work, the overlapping rectilinear red, blue, and green panels are pinned to the wall with the organic shapes superimposed on them. By 1949 when the work was shown in the Muse National d'Art Moderne in Paris, the work had been both separated from its peers and completed with the wave-like blue form at the top (fig. 4). 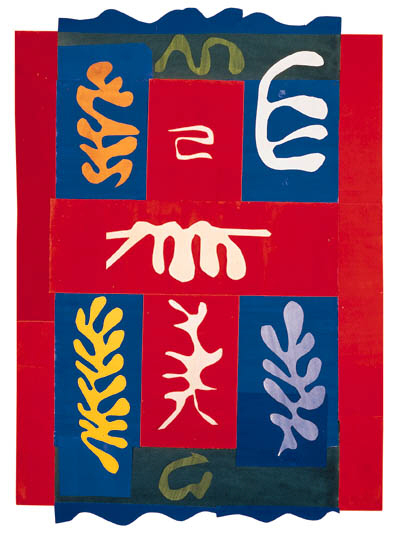 Matisse used elements cut from different red sheets and organic shapes cut from both painted and unpainted white paper. Composition la croix rouge is extraordinary not simply because of the spectacular contrasts of color and form within the work but also because it establishes for Matisse a vocabulary of composition that takes him far beyond the procedures and ambitions of his Symbolist beginning. The regularity of the composition is echoed in the windows of the Vence Chapel and the rectilinear forms of L'escargot (Tate Gallery, London) and the floating animal elements prefigure La perruche et la sirne (Stedelijk Museum, Amsterdam). Perhaps most of all, this work offers to artists who were determined to find correlations for their paradisical world in reality, a means of understanding the potency of simplicity, color and form so that it becomes "an art of balance, of purity and serenity, devoid of troubling or depressing subject matter... a soothing, calming influence on the mind." (H. Matisse, Notes of a Painter, Paris, 1908). New York, Pierre Matisse Gallery, Henri Matisse Drawings, Paper Cut-Outs, 1946-1948, February 1949.